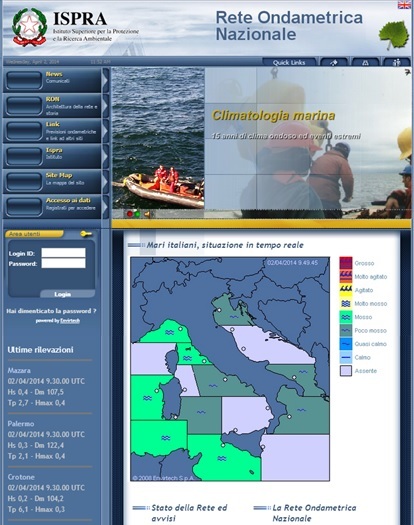 The Italian national data buoy network (RON – Rete Ondametrica Nazionale) measures sea wind waves. Real time data are available at: www.telemisura.it. RON includes 15 directional wave buoys and the corresponding land based receiving stations collecting real time series of wave and meteorological parameters every 30 minutes. It provides data needed to define the sea state, such as: significant wave height, peak period, mean period, wave direction, sea surface temperature, wind speed and direction, air temperature, atmospheric pressure, relative humidity. Buoys transmit data to shore stations within 15 nm and a small dataset via Inmarsat-D+. All shore stations are connected to the control centre based in Rome, using 2 Mbps xDSL channels, implementing a virtual private network.